Introduction: The laryngopharyngeal reflux is a clinical variation of the Gastroesophageal Reflux Disease, presenting with otolaryngologic complaints as: hoarseness, throat clearing, cough, globus pharingeus, odinophagia, laryngeal stridor and dysphagia. Objective: To identify the presence of pepsin in salive of volunteers with laryngopharyngeal reflux symptoms and to correlate with the videolaringoscopy findings. Type of study: Descriptive and transversal. Method: Twenty patients were selected with laryngopharyngeal reflux diagnosis. All of them had very similar regarding social-economic-geographical conditions, in the period from August of 2005 to July of 2006. 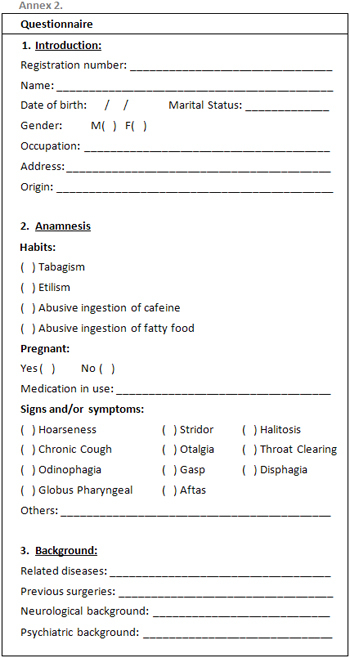 All the patients also answered a questionnaire about laryngopharyngeal signs and symptoms. They had their salive collected for posterior pepsin ratio and they were submitted to videolaringoscopy exam. Results: The most frequent symptoms between the volunteers were: hoarseness (90%), throat clearing (75%), globus pharingeus (70%), chronic cough (70%), choke (65%), oral ulcers (60%), dysphagia (55%) and otalgia (50%). The videolaringoscopy findings compatible with laryngopharyngeal reflux were observed in 50% of the volunteers with vocal complaints. The pepsin activity in salive was positive in 8 (40%) of the volunteers, being 5 compatible ones with the result of the videolaringoscopy. Conclusions: It was observed pepsin activity in salive in half of the volunteers with videolaringoscopy findings witch it is compatible with laryngopharygeal reflux. It was verified pepsin activity in salive of volunteers with laryngopharyngeal reflux symptoms and from the ones who did not present videolaringoscopy disorders, suggesting the possibility of follow-up, even before laryngeal disorders. Gastroesophageal Reflux Disease (GERD) is defined as the passage of the gastroduodenal content to esophagus or adjacent organs which may cause several symptoms and/or esophageal or extraesophageal signals(1). GERD is one of the most frequent and prevalent diseases which affect the digestive system(2). The Gastroesophageal Reflux (GER) is defined as the passage of the gastric content to the esophagus and the Laryngopharyngeal Reflux (LPR) is defined as the passage of gastric content within the laryngeal area. GER and LPR are clinical variations which are different from GERD(3). However, although they present similar physiopathology, they are not an evolutive stage of the same disease(4). The first report of acid reflux affecting larynx was done by Cherry & Margulies in 1968. However, it was after the propagation of the clinical use of optical fibers to examine larynx and pharynx that GERD started being considered potential co-responsible for several benign and malign diseases(5,6). This kind of GERD started being named laryngopharingeal reflux in 1991, by Koufman. The GERD manifestations are pyrosis and acid regurgitation. Other less frequent symptoms include eructation, hypersalivation, precocious satiety and chest pain. The most important complications are ulcers, stenosis and Barret esophagus(1). Several GERD patients look for otorrhinolaryngologists, once they do not have typical complaints such as pyrosis. They complain about symptoms related to LPR, patients carrying: hoarseness, throat clearing, cough, globus pharingeus, odinophagia, laryngeal stridor, larynx carcinoma, halitosis and dysphagia(3,7). The clinical history and laryngeal endoscopy have important co-relation with the findings of the first 24 hours. The laryngeal findings are hyperemia of the interaritenoideo space and lesions of vocal folds such as granulomas, polyps, Reinke edema and subglotic stenosis(8). The salivar flux conditions, its volume, clearance and electrolytic changes of saliva may influence the protection capacity of regional mucosa(9,10). The ideal saliva concentration is not clarified yet, but there are several studies trying to co-relate salivar composition and LPR. In one of such studies it is suggested that a deficiency in the salivar concentration of the epidermic growth factor (EGF) could be related to GERD pathogenia and act as a co-factor of RLF genesis(11). Saliva is liable for the buccal homeostasis maintenance, contributing to pH balance and oral flora balance. The saliva pH, depending on the saliva volume, may have strong interference in the laryngopharyngeal symptomatology(12), and may be influenced by the presence of gastroduodenal reflux(13). The peptic cells and mucosas of gastric glands secret pepsinogen, which is activated in the pepsin form when in contact with chloridric acid. Pepsine is a proteolytic enzyme which is active in highly acid environment (optimal 1.8 to 3.5 pH). However, in pH which is higher than 5.0, it presents little proteolytic activity and is totally inactivated in little time. On the other hand, saliva has a 6.0 to 7.0 pH and does not have pepsin in its physiological constitution(14). The presence of such enzyme in saliva has been used as reflux indicator(15). The GER and LPR are caused by the injury of the mucosa caused by the exposition to acid and to pepsin, and the laryngopharyngeal epithelium is more susceptible than the esophageal one(16). The objective of this study was to verify the pepsin in saliva and co-relate with possible videolaryngoscopy findings in volunteer patients with suggestive symptoms of laryngopharyngeal reflux. This study was done in the otorrhinolaryngology clinic of a Recife city public hospital, in which 20 patients were evaluated, all of which volunteers, aging from 18 to 85 years old, and the average age is 54.3 years old, out of which 95% were female, selected based on the LPR suggestive symptoms. All selected patients were included as they were cared and selected in the otorrhinolaryngology clinic. All of them signed the Termo de Consentimento Livre e Esclarecido (Annex 1), approved by Comitê de Ética em Pesquisa do CISAM/UPE under number 016/2005. The volunteers answered to the questionnaire which focused on complaints related to GERD and LPR and underwent laryngoscopy with 70 degrees rigid optic without the use of topic anesthetic. Saliva was collected so that the determination of the pepsin activity in the saliva were preceded according to the protocol proposed by Portluri and cols(15). The saliva collection was done by the same researcher, frozen and lyophilized. For the dosage, 1.25% agarosis was used dissolved in 0.5% normal saline solution warmed at 100º C. Bovine fibrinogen was dissolved and added to the normal saline solution to reach a final concentration of 1 mg/ml. Agarosis was put in acrylic boards up to a 1.75-mm thickness, and then cooled for 10 minutes at room temperature, granting agarosis solid aspect in which 2-mm wholes were drilled. The boards were acidified through immersion in 0.12N of HCl for one minute. A 7 µl-sample of saliva was placed inside the wholes. The boards were placed in a humid chamber during the night and interpreted after 12 hours. The agarosis gel clearing around the sample indicated digestion of fibrinogen, that is, pepsin activity. Positive control was done using pure pepsin, and negative control was done using distilled water, in same experiment conditions. The dosages were done by the same investigator, using the same preparation at once. The pepsin dosages were done without knowing videolaryngoscopy findings, as well as the videolaryngoscopies were done without knowing the pepsin dosage results. The inclusion criteria were patients older than 18 years old and with LPR suggestive symptoms. The exclusion criteria were patients younger than 18 years old, smokers, alcohol drinkers, using drugs which would reduce the pressure of the esophagus inferior sphincter, anti-reflux drugs and pregnant women. 20 patients have been analyzed, all of whom were volunteers which were within the research inclusion criteria. The volunteers aged from 18 and 85 years, and the average age was 54.3 years, 95% women. 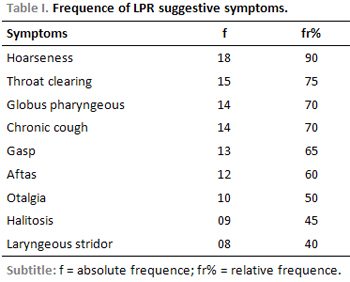 The most frequent LPR symptoms were: hoarseness, throat clearing, globus pharyngeous, cough, halitosis, stridor, otalgia, odinophagia, disphagia, aftas, which may all be seen on Table 1. The findings which are compatible with laryngopharyngeal reflux were visualized in the videolaryngoscopy in 50% of the volunteers, among them hyperemia and arytenoid edema, organ-functional dysphonia and polyp (Table 2). The pepsin activity was verified in the saliva by the researcher who did not know the results obtained in the videolaryngoscopy, as well as the researcher who performed the videolaryngoscopies did not know the pepsin dosage results. 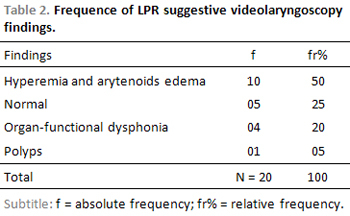 In a total of 20 samples, 8 had positive pepsin activity, 5 of which in volunteers carrying LPR suggestive videolartngoscopy (hyperemia and aritenoid edema) in three samples individuals with normal videolaryngoscopy. 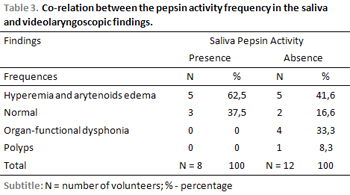 In the videolaryngoscopies with organ-functional dysphonia, there was no presence of pepsin in the saliva (Table 3). GERD is one of the most prevalent and frequent affections in the digestive system(2), which may be asymptomatic or have little gastroesophageous symptoms(17). LPR is the main cause of laryngeal inflammation and is presented as several different symptoms of GER(18). In this study, the most frequent symptom referred by volunteers with laryngopharyngeal complaints were hoarseness, just like it was observed in the study by Eckley and Costa (2003), who analyzed 157 patients suffering from GERD(19). Other symptoms were present in descending order: hoarseness, throat clearing, globus pharyngeous, cough, halitosis, stridor, otalgia, odinophagia, disphagia, aftas. The videolaryngoscopic findings which were compatible with laryngopharyngeal reflux were: edema and hyperemia of arytenoids, saliva stases in the retrocricoarytenoid region and in the piriform sinus(5). The videolaryngoscopic diagnosis was based on the criteria described above, and signals which were compatible with laryngopharyngeal reflux were observed in half of the volunteers. The videolaryngoscopic signals which were compatible with laryngopharyngeal reflux were observed in half of volunteers, and the possibility of the other 50% also carry LPR cannot be excluded, once the videolaryngoscopy just suggests it. In this study, the pepsin activity in the saliva was verified in 40% (8) of the samples of individuals with LPR suggestive complaints (Table 3). The methodology of this research for the pepsin activity used the technique described by Potluri (2003), whose study co-relates the activity of such enzyme with 24-hour pHmetry results, concluding that such parameter presents sensibility and specificity which are similar to the pHmetry(15). Considering the group with presence of pepsin activity in the saliva (8), 37.5% (3) normal videolaryngoscopies and LPR suggestive videolaryngoscopies were observed. Consequently, the co-relation between pepsin activity in the saliva and the inflammatory findings of the laryngeal mucosa suggesting LPR was verified in 25% (5)of the study sample. Such datum does not exclude the possibility of normal videolaryngoscopies develop further larynx mucosa changes. It was through the use of an immunoexperiment to detect pepsin in saliva samples collected in the pharynx of LPR carriers that Knight et al (2005) found co-relation of the presence of the enzyme in pharyngeal pH lower or equal to 4 in 22% of the study sample. Such authors suggest that the detection of pepsin in the saliva, determined by immunoassay, would be a sensible and non-invasive method to detect LPR(20). Detectable pepsin levels remain in the larynx epithelium after the reflux. Such pepsin could be without activity once the Ph in that place is 6.8. However, such enzyme could be reactivated by a subsequent pH reduction. Pepsin remains stable up to 8.0 pH(21). The volunteers who presented pepsin activity in the saliva possibly carry LPR, both the ones who presented videolaryngoscopy changes and the ones who did not present changes in the larynx mucosa. The explanation is based on the fact that the pepsin activity was found in the saliva in half of the cases, suggesting that the LPR was present in such volunteers in enough time and/or quantity to cause such larynx changes. On the other hand, in those with positive pepsin activity in the saliva and normal videolaryngoscopy, it may assume that there was not enough exposition time and/or quantity of pepsin in the larynx mucosa, which was able to lead to such findings. In both situations, with or without changes in the larynx mucosa in the presence of pepsin activity in the saliva, the individual susceptibility must be considered. Consequently, it may be understood how the LPR laryngeal disease may present clinically or not. The method used for this study was qualitative, identifying only if there was pepsin activity in the saliva or not in volunteers with LPR suggestive symptoms, thus not enabling a quantitative analysis. Therefore, the possibility of detecting pepsin in the saliva must be considered a promising sensible and non-invasive method to help evaluating and following LPR carriers. Pepsin activity was observed in half of the volunteers with videolaryngoscopic changes which were compatible with LPR. The pepsin activity was verified in volunteers with LPR symptoms and who did not present videolaryngoscopy changes, suggesting the possibility of evaluation and follow-up, even before the presence of laryngeal changes. 1. Brito CAA, Nunes JS. Doenças Dispépticas e Helicobacter Pylori. Condutas em Clínica Médica, 3ª ed. Copyright, 2004. 297-313. 3. Koufman JA, Sataloff RT, Toohil R. Laryngopharyngeal Reflux (LPR): Consensus Conference Report. Center for Voice Disorders Homepage. Disponível em: www.bgsm.edu/voice/; abril de 2001. 4. Gavazzoni FB, Ataíde AL, Herrero Júnior F, Macedo Filho ED. Esofagite por refluxo e laringite por refluxo: Estágios clínicos diferentes da mesma doença? Rev. Bras Otorrinolaringol. 2002. 68(1):86-90. 5. Costa HO, Eckley CA, Fernandes AMF, Destailleur D, Villela PH. Refluxo gastroesofágico: comparação entre achados laríngeos e digestivos. Rev. Port ORL 1997; 35(1):21-6. 6. Koufman JA. The otolaryngologics manifestations of gastroesophageal reflux disease (GERD): a clinical investigation of 225 patients using ambulatory 24-hour pH monitoring and an experimental investigation of the role of acid and pepsin in the development of laryngeal injury. Laryngoscope 1991; 101(Suppl):1-78. 7. Eckley CA, Marinho VP, Scala WR, Costa HO. PH-metria esofágica de 24 Horas de Duplo Canal no Diagnóstico da Laringite por Refluxo. Rev. Bras de Otorrinolaringol. 2000; 66(2):110-4. 8. Marambaia O, Andrade NA, Varela DG, Juncal MC. Refluxo laringofaringeo: estudo prospectivo correlacionando achados laringoscópicos precoces com a phmanometria de 24 horas de 2 canais. Rev. Bras de Otorrinolaringol. 2002; 68(1):81-85. 9. Moazzez R, Anggiansah A, Bartlett D, Owen W. Tooth wear saliva and symptoms of GERD: is there a relationship? Abstracts of the Digestive Disease Week 2002; Wl164: A-816. 11. Costa HO, Eckley CA. Estudo da Concentração do Fator de Crescimento Epidérmico em Indivíduos com Laringite Crônica por Refluxo Laringofaríngeo. Rev. Bras de Otorrinolaringol. 2003; 69(5):590-597. 12. Costa HO, Eckley CA. Correlação do pH e volume salivares com sintomas laringofaríngeos. Rev. Bras de Otorrinolaringol. 2004; 70(1):24-28. 13. Costa HO, Eckley CA. Estudo comparativo do pH e do volume salivar em indivíduos com laringofaringite crônica por doença do refluxo gastroesofágica antes e depois o tratamento. Rev Bras de Otorrinolaringol. 2006; 72(1):56-60. 14. Guyton AC, Hall JE. Tratado de Fisiologia Médica. Funções secretoras do tubo alimentar, 9ª ed., Rio de Janeiro, Guanabara Koogan, 1997. 737-740. 15. Potluri S & col. Comparison of a Saliva/Sputum Pepsin Assay with 24-hour Esophageal pH Monitoring for Detection of Gastric reflux into the Proximal Esophagus, Oropharynx and Lung. Digestive disease and Science.2003; 48(9); 1813-17. 16. Remacle M, Lawson G. Diagnosis and management of laryngopharyngeal reflux disease. Curr Opin Otolaryngol Head Neck Surg. 2006; 14:143-149. 17. Roukaimer JA, Aro P, Storskrubb T, Vieth M, Lind T, Graffner H, Talley NJ; Agréus L. Prevalence of esophagitis and endoscopy-negative reflux disease in a population. A report from the Kalixandra Study. Abstracts of the Digestive Disease Week. 2002; S1357; A-269. 18. Ford, CN. Evaluation and management of laryngopharyngeal reflux. JAMA. 2005; 294:1534-1540. 19. Eckley CA, Burati DO, Duprat AC, Costa HO. Doença do refluxo gastroesofágico: análise de 157 pacientes. Rev. Bras de Otorrinolaringol. 2003; 69(4):458-62. 20. Knight J, Lively MO, Johnston N, Dettmar PW, Koufman JA. Sensitive pepsin immunoassay for detection of laryngopharyngeal reflux. Laryngoscope 2005; 115(8):1473-8. 21. Johnston N, Dettmar PW, Bishwokarma B, Lively MO, Koufman JA. Activity/stability of human pepsin: implications for reflux attributed laryngeal disease. Molecular biology. Laryngoscope 2007; 117(6):1036-1039. 1. Master's degree. Otorrhinolaryngology Assistant Professor-Universidade de Pernambuco-UPE. 2. Doctor's degree. Assistant Professor of Physiological Science Department- ICB-UPE. 3. Specialist on Head and Neck Surgery. Hospital Universitário Oswaldo Cruz. 4. Medicine student - Universidade de Pernambuco-UPE. Scholarship by PIBIC/UPE/CNPq. 5. Medicine student - Universidade de Pernambuco. This article was submitted at SGP (Publication Management System) of R@IO on February 8, 2008 and approved on March 27, 2008, 17:41:01.